In an attempt to push myself and see how I could make Indian food look more modern, I took inspiration from a dish presented in the recipe book of 11 Madison Park. A friend of mine, who is a fabulous cook, had attempted something similar and so I too decided to give it a shot. The recipe inspiration came from a simple cauliflower curry made with curry powder, pithla which is a thick gravy made from gram flour and yoghurt and a dry paneer preparation. I first heated some oil and fried the cashews and raisins. In the same oil I added curry powder, salt and brown sugar and garlic slices. I cut the cauliflower into thick slices and first seared them on both sides to get a nice brown colour and then put the pan into the oven at a medium temperature and roasted them for about 10-12 minutes. After removing the cauliflower I used the same oil to pan fry the paneer cubes with a dash of curry powder and curry leaves. Therefore ensuring the flavours carried through every element on the final dish. Deciding to serve both with a white sauce, I decided to modify a classic roux and replaced the flour with gram flour, added a dash of curry powder again and a nice big green chilli to get some heat. Then added milk and a little yoghurt to make the sauce. To the remaining cauliflower florets, I added some chopped carrots and boiled them. After straining I added black salt instead of regular salt, to get added flavour. It then took me a good 10 minutes to plate everything! But I must say it tasted really nice. And with some improvements in the next attempt, this is a delicious way to eat vegetables. And my respect for the cauliflower has gone up after this! 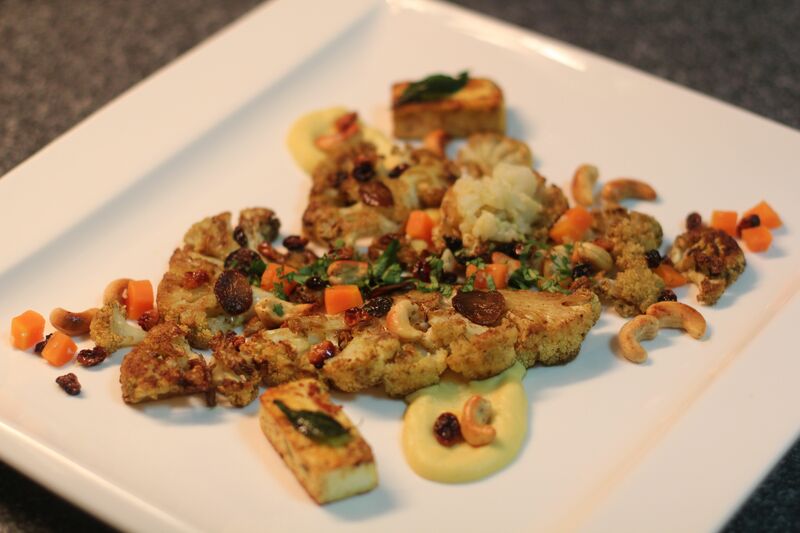 This entry was posted in Indian inspired and tagged besan, cauliflower, gram flour, modern, paneer, pithla. Bookmark the permalink.